Have you ever wondered about the lives of classical musicians? Have you ever wondered what sparked their music? Have you ever wondered about the struggles they went through? Have you ever wondered just who they were? Not all classical music was composed by dead white guys. Composers in Skirts is an intimate glimpse of the landscapes of the lives of six women composers and the music that came from them. This inspiring production intertwines the excitement of theatre with the passion of music to explore the creativity of each composer. 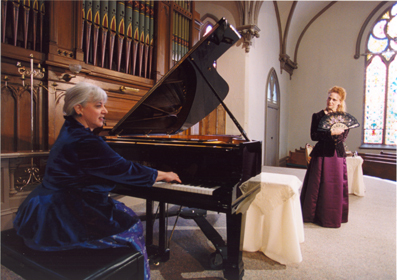 The journey begins in the 18th century with Marianna von Martinez, travels through the years with Fanny Mendelssohn, Clara Wieck Schumann, Cecíle Chaminade, Amy Beach, and ends in the 20th century with Ruth Crawford Seeger. Composers in Skirts is filled with the melodies and voices of six women who pursued their passion for art while at the same time struggling to maintain their social and personal lives.